My mom makes THEE BEST hawaiian haystacks. That is no lie. I am not normally a rice or a cream of chicken soup fan (you can easily make your own cream of chicken and sub it out) but I will say that this recipe is phenomenal! I gobble it up faster than I can get it on my plate. My husband will have 4 to 5 helpings himself! (don’t ask me how a personal can eat 4-5 helpings of anything and stay as thin as he does). Well lucky you, today my mom is sharing her recipe with you! Once you try this, you won’t want to make it any other way! 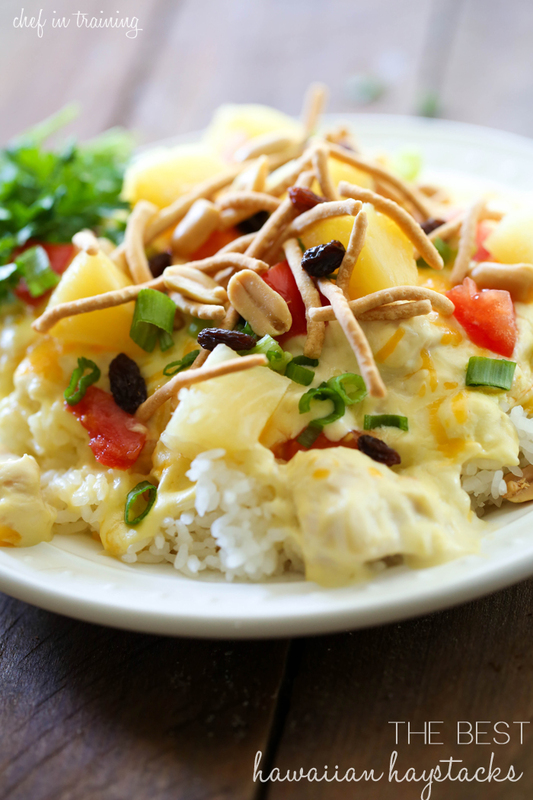 Of all the recipes I have tried, none come close to this amazing creamy chicken topping! In sauce pan add chicken, sour cream, cream of chicken soup and milk. Heat and stir in saucepan over medium heat until mixture is heated evenly throughout. Top it with all your favorite toppings. I love ALL the toppings! The more the merrier! Same with condiments and dips and dunkers...I need a whole bunch and the more I can try and hoard, the better :) Pinned! Happy Labor Day, Nikki! I've never heard of Hawaiian Haystacks before, but thank you, Nikki's mom, for sharing. I love all the toppings you've listed for us to choose from... Pinned for my family to try! My mom used to make this especially if we had a big group to feed. Everyone loved it! How many servings does this make? 4? This recipe was wonderfun, my family and I really enjoyed it! Thank you! However, be warned! Do not store leftovers together in the fridge for lunches the next day. I don't know why, but the falvors that were so good last night are AWFUL as left overs, be warned. If I cut my tongue off to get rid of the nasty taste I would, right now I'm tearing my dest apart looking for a breath mint or piece of gum to see if that will help! The reciep was a five star hit last night, but the next day the blend of tastes and textures DON'T taste the same. I would try storing everything separate and reassembleing them the next day too! You do not mix everything up when you serve it the first time, right? So why mix all the toppings for leftovers. Of course you would store the sauce and all the toppings separately. Then just reheat the rice and chicken sauce when use the leftovers. I really like this recipe. My mom made these when I was younger but it had fatty cream in it, so I like that these are lighter. I use plain yogurt sometimes if I have it on hand in place of the sour cream because it is much healthier and tastes just the same. :) Thank you for sharing!